Perfect for creating a homey, cozy atmosphere, this cotton quilt set includes one quilt and two matching shams. The quilt is fully reversible, one side featuring a patch-work design, and the other showing a solid red. Machine washable, this soft bedding set is a wonderful way to make your house feel just a little more like home. Warm rich colors. We have this quilt in 2 colors. The red is our December holiday quilt. The quality of both quilts is wonderful. The extra inches allow for a good side drape. The stitching is very neat and the value for price is excellent. I love the fact that it is cotton. It's warm in the winter but not too bulky. Washes well. Well made. Washes up great. Works perfectly in our cabin. I have had this for over a year now...I wash it once a week (because 4 English Setters sleep on it) and it is still in great condition and the color hasn't faded too much. 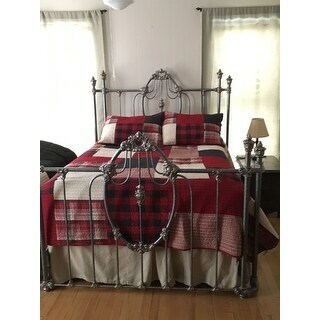 Fits our queen size bed perfectly Seems to be very good quality and we love the look/pattern. Daughter paired this with some black and red hockey accent pillows and décor to make her room more modern/mature but still fun.. Purchased the matching shower curtain but altered it to make curtains for her room. Very happy with our purchase.. I bought this and the shower curtain to use as a drape to match this in the bedroom . This is a beautiful heavy cotton weight and very welk made. The burgandy red is a beautiful rich full bodied red. I love it and will use solid and printed side. Its reversable too. The pioolw shams are beautiful. And look wonderful with the comforter. This quilt set is really pretty. Not too red, looks like it belongs in a Log Cabin, has that comfy cozy look. The quality is very good also. 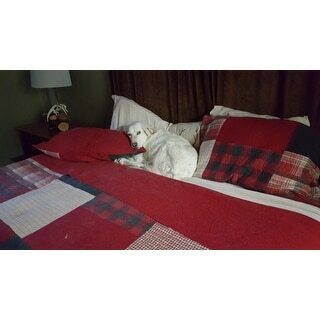 We live in the Northeast and with flannel sheets keeps you nice and warm on a cold winter night. I was SO excited to see this quilt on Overstock! I had been looking at the same one at BB&amp;B for a long time, debating on whether or not to get it. I went to UGA, and it was the perfect quilt for my long-awaited "Georgia room". It was *** for just the quilt. Then, I saw it on Overstock, including the shams, for right around *** ... hallelujah! Thanks, Overstock!! Woolrich is the way to go! I love the way it feels, soft and durable. We bought these for our guest bedroom and really like the pattern an quality. We have since purchased the shower curtain, throw and pillow to match. It really brightens up the room. Thank you! I love it very much. This is not only very beautiful but is good quality. It is not bulky but very warm and heavy weighted. I love it and many people have asked me where I got it. "Will the king size be back in stock anytime soon?" "Is this a patchwork quilt or a solid piece of fabric?" It is patchwork, Connie, using large, approximately 16" blocks sewn together. The backing is 1 piece. It's a lovely quilt, and I'd buy it again although it does attract lint! "Is this quilt red and black or red and navy?" "Is the red a true red or more of a maroon red?" Red is a tough color to match, as well as to catagorize. I would say this is definitely red, but a dark red. A colonial red. A rich red. I don't see any burgundy in it. I would say the red is more red than maroon or burgundy. It is a bit darker red than traditional fire engine red. "I am looking for a lighter weight quilt for summertime. 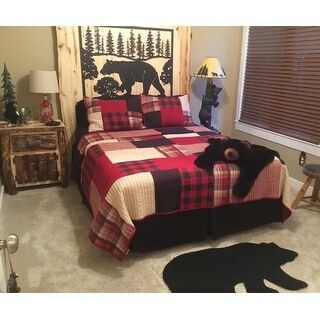 Would you recommend this quilt?" This is a mid weight very well made quilt. I use it year round with and without a blanket. Just beautiful and it washes nice too. "can I get a bed skirt to match this?" "Is that white or offwhite?" I would say it's a cream. It's definitely not white. It blends beautifully with the other colors.